Circle pins have that "oh - so 50's" look that's perfect whether you're going steady, giving it as an eternal friendship pin or want to look like Sandy in Grease. Perfect on a sweater, blouse or jacket lapel. Try tying a scarf around your neck and holding it in place on the side with a circle pin. 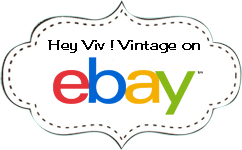 We have so many styles of classic, vintage pins in stock, each is a one of a kind design. We will choose a beautiful one to send you. Most are 3/4" - 1 1/2" across and have a closed pin back. The pictures shown in this listing are just a few examples.